Are tuition fees really heading for scrap heap? "This is only going to end one way," says Lord Adonis, Labour peer and one of the architects of an earlier version of tuition fees. "Almost no-one inside or outside government thinks they will survive." Before last month's general election, the position of tuition fees in England looked unassailable. The government had rammed through legislation at the last minute, increasing fees to £9,250 per year. And the proposal by Labour to scrap tuition fees had been met by university leaders with a polite shrug. But there seems to have been a huge sea-change in attitudes. So what has made such a difference? "The straw that broke the camel's back," says Lord Adonis, has been "indefensible" interest rates of 6.1%. This has focused attention on the scale of debt from higher fees and interest rates - spinning upwards to £50,000 so far for an average graduate, with fees set to increase every year with inflation. "It's about as bad a political gambit as you could imagine," says Lord Adonis. "Can you seriously see the Conservatives going in to the next election with fees at £10,000, interest rates at 7% and debts at £60,000?" He argues that a reformed version of the fee system could have survived with cross-party support, but now it has become irredeemably toxic. Even if fees were "cut drastically", he says, it would still not be enough for young people, who will want them to be completely scrapped. And a partial reduction would still mean a financial black hole, with "lots of political pain for not much gain". The inescapable outcome, says Lord Adonis, is that an entirely different approach will be needed to fund universities. The sense of political doom hanging over fees, he says, reminds him of the poll tax. Lord Adonis is the type of reforming Labour politician the Conservatives like to applaud. With a minority government hanging by a parliamentary thread, any cross-party push on reforming fees would cause ministers deep problems. And concerns about fees are emerging. Conservative MP Nick Boles, writing in the Guardian, said charging high interest before students had even finished their courses was "simply unacceptable". The meter on interest charges starts running as soon as courses begin, with the Institute for Fiscal Studies saying students would owe £5,800 in interest charges before they even graduated. 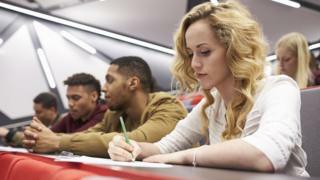 "It is unutterably depressing for hard-working students to see the amount they owe spiralling upwards, before they have even started paying it off," Mr Boles wrote. The election saw huge swings to Labour in university seats - and any Conservative MP defending a narrow majority might want to review a system that will see tuition fees rising every year. This is also a very middle-England issue. More than half a million young people start university each year. According to the IFS, middle earners could end up paying £40,000 in interest charges, on top of what they have borrowed. Prof David Green, vice-chancellor of the University of Worcester, says the current fee arrangements have "lost credibility" when they become a long-term pay cut for people such as nurses. For nurses and midwives, he says, it will mean "their debt never diminishes in real terms until it is eventually written off after 30 years". "Instead, they will simply receive a take-home pay cut of 4.7% and a shackle of a growing £50,000 debt. "This makes absolutely no sense when there is a significant and growing national shortage throughout England of both nurses and midwives." The way interest is levied is also under scrutiny. Estelle Clarke, a former City lawyer on the advisory board of the Intergenerational Foundation think tank, says student loans have less consumer finance protection than a basic product such as a credit card. She says if they were properly regulated, they would be unlikely to apply the monthly compound interest used for student loans. And if inflation goes up further - as is entirely possible - interest charges for students will also rise, adding to student loan debts that have already passed £100bn. This could become even more complicated, as the government is planning to sell off students' debts to private investors. Any rowing back would mean taking a political hit and accusations of a U-turn. But sticking to the current plans would mean committing to a long upward curve in fees, which would be even more controversial by the next election. The Education Secretary Justine Greening says there needs to be a more honest debate about the cost of scrapping fees - both in financial terms to the public finances and in removing the funding for extra places. "I'm someone who was the first person in my family to be able to go to university, and that matters to me a huge amount," says Ms Greening. "I think the debate has revolved around what's the best way to enable access to our universities. "We've seen a debate about whether that's no fees or no cap. "When you bring a cap in, that means fewer students have a chance to go to university. "We know that when there are fewer places at university, who gets them? "We know that it's students who are doing better in our school system - and that tends to be students from better-off families. "I really do feel that the Labour party should come clean to young people about the consequences of its no-fees policy. "They should be frank with people that what they've said in the run-up to the election about effectively writing off student debt was a false promise."